Sanfermin is one of the greatest fiestas in the world. These fiestas should be visited by everyone at least once in the lifetime. Many visitors who come to the fiestas of Sanfermin in Pamplona say that they are among the best in the whole world. The reasons why these fiestas rank in practically everybody’s top seven list of fiestas worldwide is that there is a lot of partying, a lot of good vibes and both go on hand-in-hand during a lot of hours. Sanfermin fiestas are famous for never holding-up. That means that you can come across a wide variety of special moments and special events at different times of the day and night. In Pamplona, from the opening Txupinazo event on the 6th July, there is room for all kinds of people and those of very different ages can all find their particular corner to have a hell of a good time in. At how many fiestas could you go with your mother-in-law or your own daughter and still be sure that both of them will have a very enjoyable time? …Pamplona in fiestas is one of those places. The Running of the Bulls is the best-known event of the Sanfermin fiestas but it is by no means the only one. There are lots of other ways to enjoy yourself between the 6th and the 14th of July. Even if you have no interest in bulls, you can still enjoy the fiestas to the maximum. There are many people, and indeed, many local people who enjoy the fiestas intensely and who never watch either the Running of the Bulls or the Bullfights. On his feast day, on the 7th of July, there is an important procession in his honor around the old part of the city of Pamplona. It is to this saint that the runners in the morning Running of the Bulls sing their homily to implore his protection just before the bulls are released onto the streets. However, the partying and other events in fiestas do not have any religious character. The partying and the fiesta are mainly lived out in the open streets. It is normal to be in the street, to dance in the street, to sing in the street, to talk in the street. To share the street with everyone else. Normally, the weather should be hot in Pamplona in July, and part of the fun is to enjoy this warmth. Besides, there are times when the bars are just too crowded to handle everyone and the people are more comfortable out on the street. Noisy yes, but is important too to respect the neighbors who may be trying to catch up on some sleep. All those who take part in the fiestas do so with these two premises at the forefront. If you come to Sanfermin then you should also share in these values of joy and respect for others, especially respect for all females, and in this way you will get more out of your visit and the whole scene you encounter in fiestas. 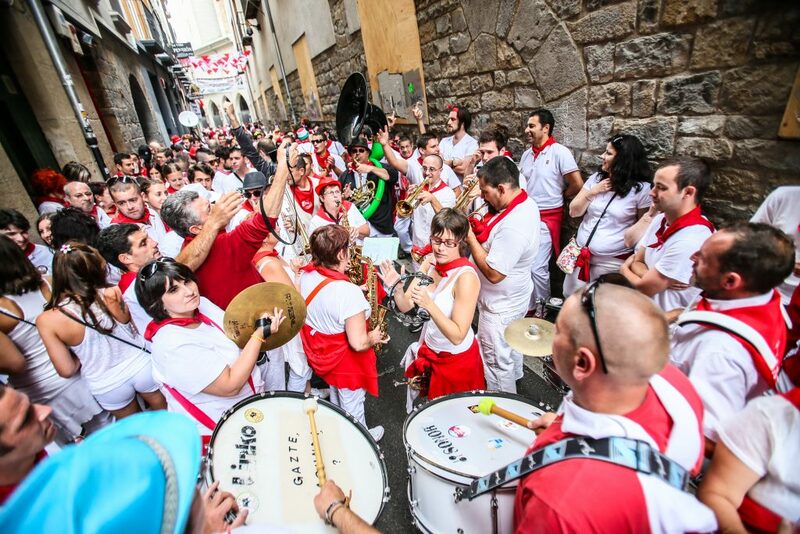 The attractive side of the Sanfermin fiestas lies in the fact that you do not experience the fiestas as a mere onlooker or visitor, but rather you can enjoy it in full active participation, just as the locals do. Could you imagine going to the European Champions Football Final or the Six Nations rugby and being allowed to actually play in the game? In Pamplona, between the 6th and the14th of July this is indeed possible. But it means having to play your part too in order to fully enjoy the Sanfermin fiestas in the same way as everyone else. © Javier Martínez de la Puente. Sanfermin 2014. 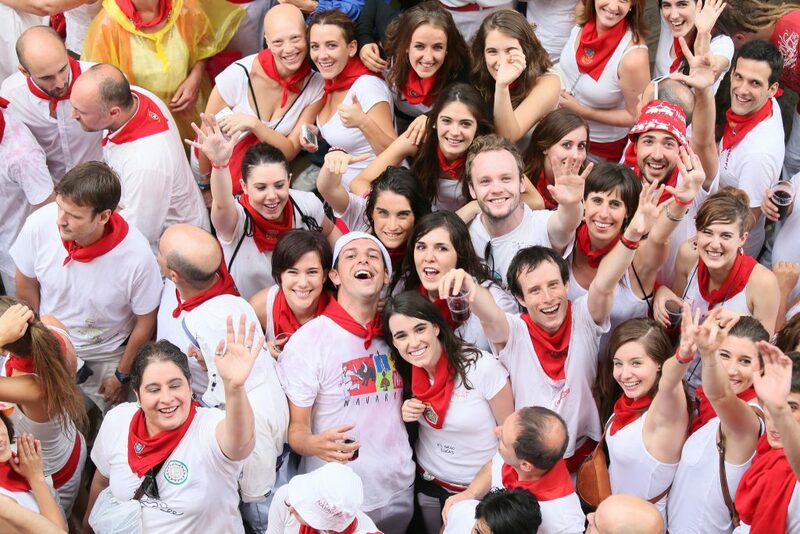 The people of Pamplona with their own initiatives are a basic ingredient of the fiestas. That is to say, outside of the official program prepared each year by City Hall, there are a large number of other fringe activities organized by neighborhoods, gastronomic clubs, sports clubs as well as some firms such as Kukuxumusu, etc. One essential ingredient of the fiestas is the key role played by the Peña clubs and their brass bands as they liven the streets with their bands and banners. Pamplona is a relatively small city which more than doubles its number of inhabitants during fiesta days and indeed, triples that number at the weekend or weekends, depending on how the eight days of fiesta fall. It is normal to find people from many parts of the world who have travelled to the fiestas. So don’t keep to a tight schedule or come with a closed mind. Take a laid-back relaxed attitude and let things unfold and for sure you will have some good times. One piece of advice: when you see one of the Peña club brass bands parade on the streets, follow it around for a while. Ernest Hemingway signposted the road to Pamplona for many foreign visitors when he published his novel The Sun Also Rises. James Michener also made his contribution with The Drifters. The attractiveness of these books from two such fine writers continues to stimulate many readers to make their way to Sanfermin fiestas. Many places mentioned in these books continue to exist intact and it can be fun to discover them and it could be the perfect excuse to make the trip and search them out. Access to health service is guaranteed to all. Should you have any physical ailment, you will find treatment for it. Navarra has a good name for its health service both for injuries caused in the Running of the Bulls as well as for any other injury or wound you might get in fiestas. However, if you are from abroad, it is almost sure that they will charge you for the treatment. For that reason, it is worthwhile taking out insurance for your trip that will cover all health issues. One piece of advice, read the small lettering of the insurance policy as some of them might exclude the Running of the Bulls from their coverage and indeed also the fountain jumping which tends to go on in the Navarrería area of Pamplona. -The bulls are not simply let loose in the streets of Pamplona. There is a fenced-in route which has limited access to it, particularly in the time leading up to the start of the Running of the Bulls. Check out our section on The Running of the Bulls to learn more about this event. –There is absolutely no obligation on the part of anyone to run in the Running of the Bulls. No face is lost at all by not taking part in this event. Many people simply enjoying watching the bulls from the sidelines and balconies or from a seat in the bullring. Sanfermin.com can help you get a good spot to watch the event from. -It is not a local tradition to jump from the fountain in the Navarrería. This was started by foreigners and is almost exclusively carried out by them, despite the fact that City Hall frowns on this activity. 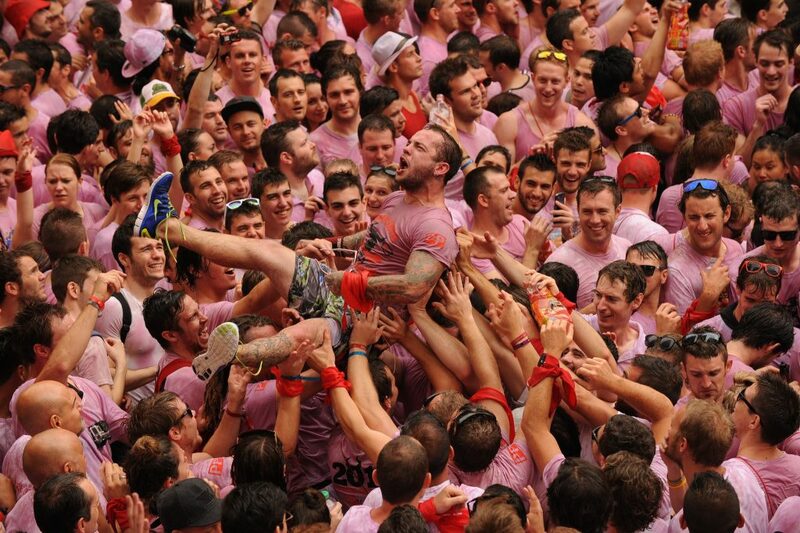 -Sanfermin is not at all a sexually permissive fiesta. Everyone is respected just as they would be in any other quite different situation and that applies both to men and women from whatever class or condition they might come from. 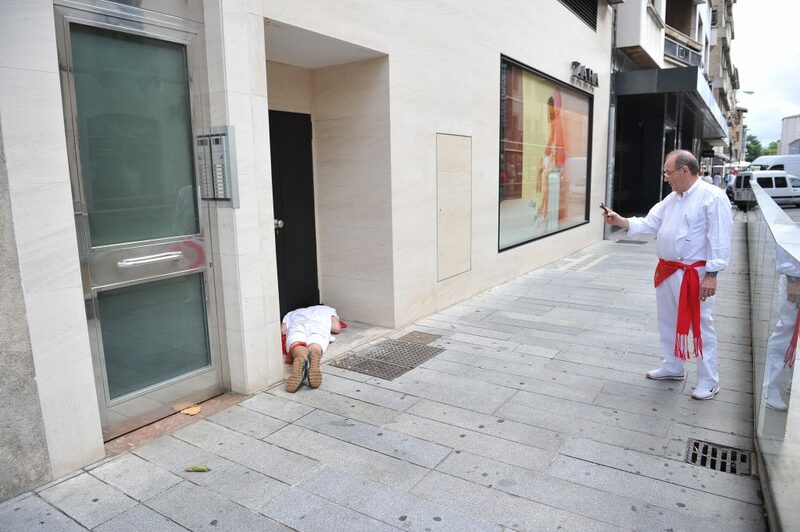 –It is not really normal to sleep out in the open air in the parks of Pamplona in Sanfermin. It is much better to try to get a hotel, apartment or camping site. It is true that you can find people who are totally played out from the partying and who take a rest and nap at whatever spot they can find before heading home to their beds. No camping is allowed in any of the many small city parks. However, if someone crashes out on the ground and particularly in the parks, a blind eye is usually turned as it is understand that the person is not in any condition to make it home or to his hotel or whatever. © Mikel Ciaurriz. Sanfermin 2015. The red scarf is a distinctive element of the San Fermín festival, so much so that tradition says that you only wear it on your neck while the festival lasts. This is why before the rocket is fired, the people have it on their wrist, in their pocket or in their hand, waving it in the air when the person responsible for starting the festival shouts, “Viva San Fermín, Gora San Fermín”. When the festival begins, the scarf takes its place on one’s neck or head, as imagination and fashion would see fit. Other people in Pamplona back the idea of the scarf as a custom of the city of Pamplona, which would give weight to the martyrdom of San Fermín, which is the thing about the Vow of the Five Wounds. This was established in 1599 as an act of gratitude for the eradication of a plague that killed a third of the population in Pamplona. More effective than the medicines, of which there were none, was to place a sign on the chests of the sick representing the five wounds of Christ. Given the effectiveness of the measure and in thanks, the city authorities decided to permanently celebrate this vow called “of the Five Wounds”, which is precisely very similar to a scarf around the neck.